I was fortunate earlier this year to hear Jay Griffiths read some of her book about the anti-road protests (see photo left). It was at 'Soundbites' at the Great Oak Cafe in Llanidloes in March - a bit like Stroud's Coffee House Discussions except they have three artists - this time it was a couple of bands and Jay - loved it all and the food! Well I read her book, 'Pip Pip: A Sideways Look at Time', a while back and loved it - it explores the political nature of time, and looks at all the different ways in which indigenous cultures perceive time. It is as the website says, 'a polemic against the play-less, life-denying ways in which modernity sees time.' The book cover has even been used in student protests last year - see here. 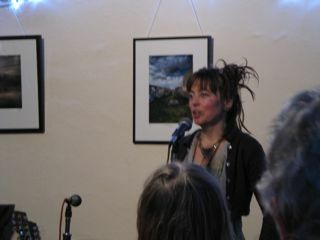 See her in The Ecologist talking about Wild here. Order them through our local bookshop here. Thank you Jay for two wonderful reads!